Discussions about demolitions and forced displacements are usually contentious, especially when unlikely allies come together to have a dialogue on how to tackle this common problem. 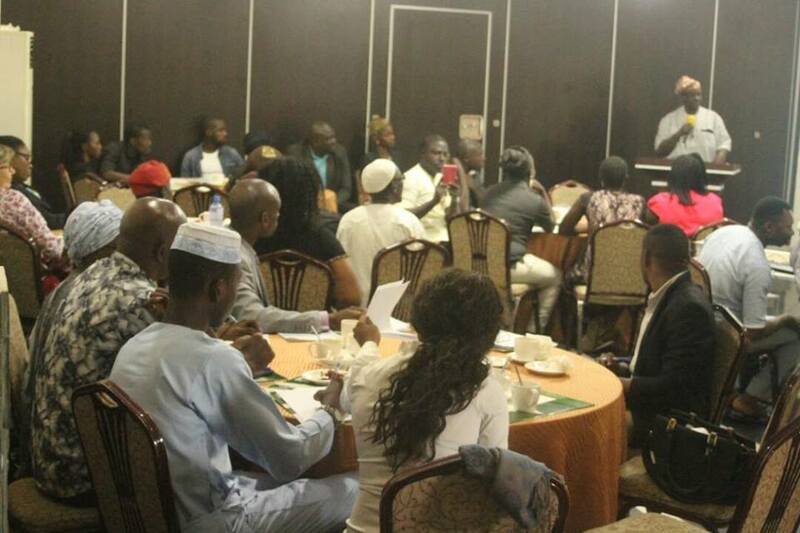 SPACES FOR CHANGE’s | S4C’s July 26, 2017 multi-stakeholder dialogue between slumdwellers and urban policymakers in Lagos State marked the turn of the tide. The one-day dialogue, ‘‘Towards Inclusive Human Settlements in Lagos State’’, brought residents of informal settlements and their community leaders from Ijora Badia, Ilaje Otumara and Ebute Metta, together with the representatives of the Federal Government-owned Nigeria Railway Property Corporation (NRPC), the Lagos State Office of Civic Engagement, the Lagos State Ministry of Justice and the Ministry of Local Government and Community Affairs under one roof to explore a common strategy for tackling social exclusion, marginalization and forced displacement in the state. Also present were representatives of the media, community movements and non-governmental organizations that work on urban issues. In Nigeria, decades of campaigning for housing justice, in the form of public petitions, street protests, court actions, formal meetings, policy dialogues and other dispute resolution mechanisms have yet to produce satisfactory results. Urban renewal, including infrastructure development programs of the state and federal governments continue to exclude the urban poor, especially those who live in informal settlements. Mass demolitions mainly ordered by state actors are still being carried out without consultation, compensation or resettlement, leaving thousands homeless annually. The urban policies and programs introduced to enhance the production of human settlements are anything but inclusive. ‘We must collectively find a way out of this dilemma’, S4C’s Victoria Ohaeri said in her opening remarks. Real victory, or housing justice, for the urban poor is assured when government actors and other stakeholders are influenced to think differently and plan for cities more inclusively. Pushing this line of advocacy, S4C raised three posers to the participants: What specific mechanisms need to be developed (or strengthened) in order to deepen engagement between the urban poor, policymakers and other urban stakeholders? Are there alternative models (adopted elsewhere) for improving access to land and secure tenure that Lagos State Government should consider? When evictions become very necessary, would the State consider adopting an eviction guideline that is anchored on international human rights standards? The first poser highlights the need for informal communities to engage and dialogue more frequently with the Lagos State Government in light of the enormous developmental plans of the state, most of which have implications for forced displacement. On the second question, S4C flagged examples of models from similarly-situated contexts, which have been used to increase housing availability, affordability and delivery for the poor. For instance, in Munich, Germany, developers are required to reserve a certain quota for low-income earners in all housing developments. Building on this finding, S4C wrote the Lagos State Governor on July 13, 2017, requesting him to reserve a quota and a mortgage plan for Badia-East residents at the state-owned Jubilee Estate in Ijora Badia, Lagos, as evidence of the government’s commitment to inclusive human settlements in Lagos State. While acknowledging that there may be circumstances in which evictions may be necessary, S4C’s third poser offers to develop a uniform eviction guideline that will guide mass evictions linked to urban development programmes in the state. These posers set the stage for a lively debate and robust discussions around urban displacements in Lagos State. Moderating the discussions, S4C presented a factsheet Towards Inclusive Human Settlements in Lagos State detailing the complex intrigues underlying the recurrent demolitions and mass evictions in Badia-East since the 90s. Badia-East is also a theater for fierce land disputes between chieftaincy families and residents of informal communities. Not only that, the Lagos State Government and Federal Government-owned Nigeria Railway Property Corporation (NRPC) have announced plans to use portions of their land for public purpose projects. The conflicting and convoluted interests in the land, the protracted court actions and the mass demolitions that have ensued, buttress the need for specific government departments that can attempt to mediate complex land disputes at a shorter time. The slow system of formal adjudication aggravates the situation, and makes this proposal even more imperative. Officials and representatives of the Lagos State ministries participated actively in these conversations especially around deepening community-government interactions. They argued that in line with the Lagos State Development Plan, 2012-2025, the achievement of a mega-city status requires citizens to make a lot of sacrifices. An official suggested that the routing of complaints and proposals through the community development association (CDA’s) has been effective. The CDAs are loose associations voluntarily formed by residents for the promotion of development in their communities. Engaging communities is not a one-off exercise, but a lengthy and painstaking process. Officials also shared information on the plethora of mechanisms, adhoc committees, and agencies established for the purpose of expanding citizen’s access to information and participation in urban planning. .
An official of the Directorate of Citizens Rights (DCR) under the Lagos State Ministry of Justice enlightened on the agency’s scope of operations and how it resolves disputes among willing parties. All their legal services are free. DCR’s dispute resolution services extend to land-related matters. When mediation becomes too complicated, land matters are referred to the Lagos State Committee on Land Grabbers which has achieved tremendous result in its actions against land-grabbers in the state. She urged participants to timely report issues of human rights infringement, land grabbing and other sundry issues to the DCR. Residents and representatives of informal workers’ unions and communities, led by Seinde Ebiesuwa of Communities Alliance Against Displacement (CAAD), Ayo Ademiluyi of the Federation of Informal Workers (FIWON) and Comrade Ishola Agbodemu of the Rural Urban Development Initiative, shared different perspectives on the land disputes and displacements affecting their communities. They regaled government officials with multitude of examples where state-led dispute resolution mechanisms did not work. They, however, raised additional posers for ensuring and sustaining community participation in urban planning, given the repeated failures in times past. They particularly urged the Lagos State Government to go back to the housing development models of former governor Lateef Jakande which made housing available for low-income earners. One question that dominated the conversation is the rationale behind few chieftaincy families controlling about 90% of the land in Lagos State. From Badia, to Makoko, Maroko (now Lekki), Atikporome, Otodogbame, families like the Onirus, Olotos, Ojoras, Elegushis etc, have been linked to land tussles, disputes and demolitions across urban settlements in Lagos. Chief Festus Arowojolu, Baale of Ilaje-Otumara, a sprawling informal settlement in Lagos Mainland has some answers. Baale Arowojolu argues that land ownership essentially rests on migration, political patronage and other traditional alliances. He embarked on a historical trajectory of their occupation in Otumara Ilaje, which dated back to 1939. With the increasing moves to threaten and forcefully evict the people of Otumara, Baale Arowojolu called on Spaces for Change and Lagos State government to save them and improve their access to basic infrastructure. NPRC praised the proposal for the reservation of quotas for low-income earners in all housing developments in the State. This quota system shares certain features with the notion of temporary occupation licenses. In the 70s, the social service construct of the Nigeria Railway Corporation (NRC) gave room for the granting of temporary occupation license (TOL) at discounted prices, but in addition, gives licensees 6-months notice to return the land whenever the need arises. Land is a valuable asset to the state as well as to individuals. Where the NRC finds that certain portions of land are not immediately required for public purposes, TOL is a method of disposing land without full alienation, fulfilling the needs of the state and individual citizens albeit temporarily. This method has successfully been tried in Tanzania, and is recommended for state governments determined to fulfill their housing needs to citizens. Empowering those who live in the informal settlements, and often targeted with land-grabs and forced evictions, to become active stakeholders in the urban regeneration processes is S4C’s main goal. This dialogue is the first in a series of discussions that will be held around the theme of fostering inclusive human settlements in Lagos State in line with Goal 11 of the Sustainable Development Goals. To S4C, this meeting represents an important first step forward in the acknowledgement of the rights of slum communities to be protected against forced evictions and homelessness. PreviousPrevious post:Life After Forced Evictions in Badia-East (#SaveBadia)NextNext post:FACTSHEET 01: What is the FATF? Why Is It Important?